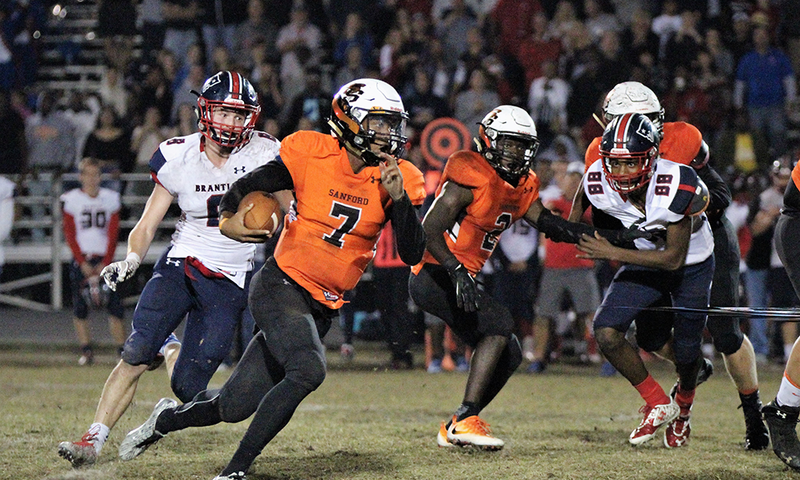 SANFORD, Fla. — There were six, count em six, lead changes in the fourth quarter in what is now an instant classic between the Sanford Seminoles and the Lake Brantley Patriots. Behind four touchdowns and 235 rushing yards from DJ Hampton, the Seminoles escaped 48-41 over Lake Brantley, extending their perfect season and sending the Patriots home. THE INFO: The Patriots jumped out to an early 3-0 lead and then recovered an onsides kick threatening to extend their lead. The Noles defense forced a three-and-out and the team was in business. Vernon Mamwell broke free for a 59-yard touchdown. Minutes later, Carneilous Dennison scored his first of four touchdowns. A 10-yard rush by Dennison gave the Patriots their first lead since the first quarter. Hampton would have none of it. The senior responded moments later with a 70-yard touchdown of his own setting the score at 14-10 Seminole after the first quarter. However, things were just getting started. Seminole took control of the game, 21-10 as quarterback Kaylan Wiggins connected with Juri Sabb on a 43-yard passing touchdown. The Patriots were unable to score before half and the Seminoles led 21-10 at home. Lake Brantley running back Trace Christian began to warm up after a quiet first half. Christian was brought down at the 10-yard line of Seminole. Two plays later, Patriot quarterback Marcus Dequattro scored from 7-yards out and the score was now 21-17 mid third quarter. The Noles tight end and UCF commit Gabriel Davis caught a ball at the 15-yard line which led to a 15-yard rushing touchdown by Hampton on the very next play. Dennison scored again giving Lake Brantley life trailing 28-23 at the end of the third quarter. Lake Brantley defense sacked Wiggins and then partially blocked the punt attempt giving their offense a chance to take back the lead. They would do just that. A 10-yard rush by Dennison gave the Patriots their first lead for the first quarter. After the failed two-point conversion, Lake Brantley led 29-28 over Seminole. Once again, Hampton would have none of it. On the first play of the drive, the senior bounced to the outside and ran 83-yards less than a minute after the Patriots took back the lead. Seminole now led 34-28. Trace Christian gave Lake Brantley another one-point lead with seven minutes to play on a 33-yard run. And soon enough fans realized it would come down to who would score last in this playoff game.Christian finished the night with 152 yards on the ground. Wiggins found Davis on back-to-back plays setting the Noles on the 50-yard line with five minutes remaining. Head coach Don Stark was faced with a tough decision as his quarterback faced fourth and third down by one. Wiggins pulled through and converted on 4th and short. The senior quarterback then sailed a pass over the defender and into the hands of Gabe Davis for a 21-yard touchdown catch. Less than four minutes remained as the Noles led 40-35 over Lake Brantley. The Patriots were able to take a chunk of time off the clock and take back the lead. Dequattro hit as he threw converted a pass to the 32-yard line of Seminole. The Patriots found themselves at the one-yard line with less than a minute in the game. Dennison appeared to fumble the ball at the goal line but was credited a one-yard rushing touchdown. The controversial score gave Lake Brantley a 41-40 with 57 seconds to play. He would finish the game with 136 yards and four touchdowns on 22 carries for the Patriots. KEY PLAY OF THE GAME: All night long, the Patriots were avoiding to kick the ball in the direction of Hampton on the kickoff. However, Hampton felt like he needed to make a big play late in the game. He did just that; returning the ball 80 yard to the 9-yard line of Lake Brantley. The very next play, Hampton rushed to the right side for a nine-yard touchdown icing the game with 39 seconds to go. The Patriots were able to get the ball to their 38-yard line with one second left in hope of a hail mary touchdown pass. Dequattro hung in the pocket as long as he could looking down field but came up empty handed on the final play of the game. DID YOU KNOW: The Seminoles are now (11-0) on the year, the first time back in the Regional Finals since 2010. This was the second time this season that these two teams faced each other. Back on September 30, Seminole won 35-28. Tonight, the Noles came out on top but not nearly in the same fashion as both teams combined for 38 points in the fourth quarter alone. QUOTABLE: “It was two great teams going at it and two teams that know each other well. We were just able to make one more play than them at the end of the game. I am proud of the way our kids kept fighting and never gave up. It was literally the difference of one play. We talk about it all the time– not flinching and they didn’t flinch this game and I’m very proud of them for doing that. We look forward to going into Winter Park and playing them next week,” said Seminole head coach Don Stark. WHAT’S NEXT: It’s the end of the line for Lake Brantley and company. The Patriots, led by first-year head coach David Delfiacco, finish the season (7-5) and hope to return to the playoffs next season. As for the Seminoles, they have a tough task at hand. While the Patriots and the Noles were in the middle of a playoff classic, so were Timber Creek and Winter Park just down the road. The Wildcats, District 8A-3 champions, won the rematch 35-21 over the Timber Creek Wolves. The Wildcats (9-3) will host Seminole in the Class 8A-Region 1 Final for a spot in the State Semifinals. The winner of next week’s matchup will play the winner from Region Two between Dr. Phillips or Vero Beach in the 8A North State Semifinal.